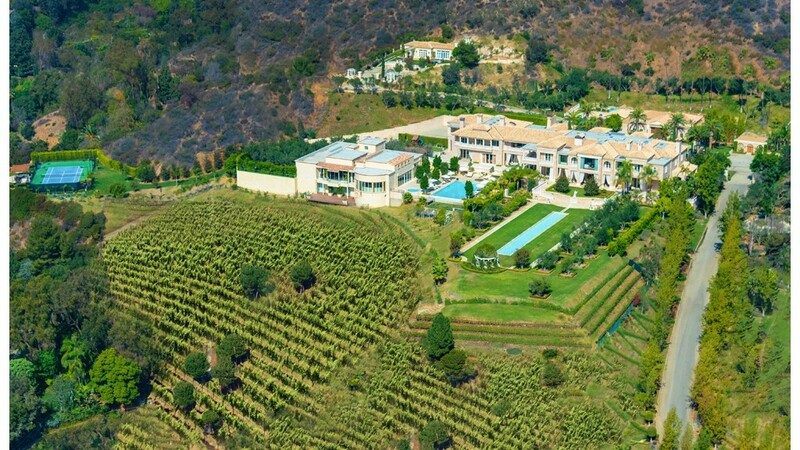 A massive Beverly Hills, Calif., estate with its own entertainment complex, 27-car garage and vineyard has hit the market with a record breaking listing price of $195 million. That makes it the most expensive home listing in the United States, according to Coldwell Banker. Called the Palazzo di Amore (or "Palace of Love"), the estate is enormous with 53,000 square feet of living space, 12 bedrooms and 23 bathrooms. The master suite alone -- at 5,000 square feet -- is bigger than most McMansions. On the 25-acre property, there's a vineyard that produces 400 to 500 cases of syrah, cabernet, sauvignon blanc and other wines each year. There's also a guest house, formal gardens, a spa and a 128-foot long reflecting pool. The estate is owned by real estate mogul, Jeff Greene, who bought the place as an investment and rents it out for $475,000 a month. In fact, Greene barely spends any time at the Beverly Hills estate, instead preferring to spend time at his home in Palm Beach, Fla., or at his summer house in the Hamptons. Visitors arrive through one of three sets of double gates and drive a quarter mile to the front entrance, where they encounter an Italian-made fountain carved of Carrara marble. They can park pretty much anywhere. The estate has a 27-car garage and 150 additional parking spaces. The house design is rather informal, except for the stunning entryway. 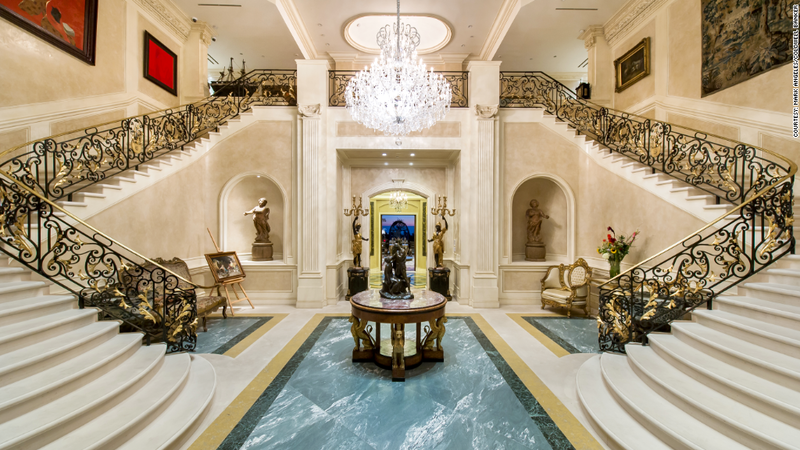 The main residence is more than 35,000 square feet with a front entryway that is a grandiose display of statue niches, inlaid marble floors, classical revival pilasters and a double staircase of marble and ornamental metalwork. Don't feel like climbing the stairs? Take the elevator. There's a hand-painted night sky ceiling in the media room. 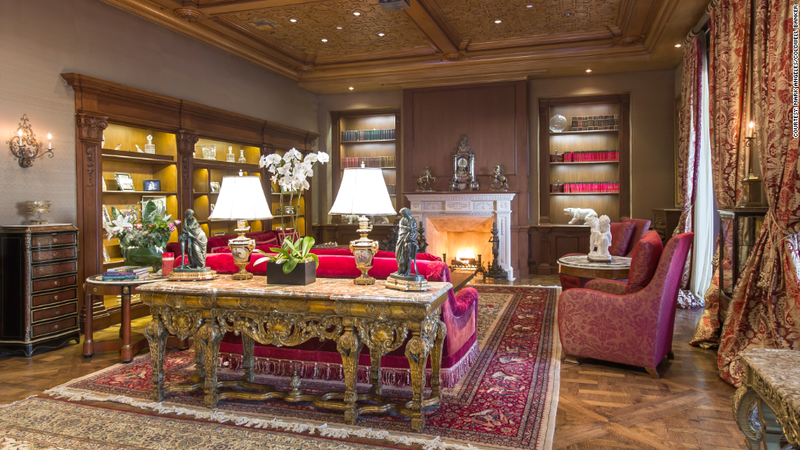 The Palazzo di Amore was made for entertaining. 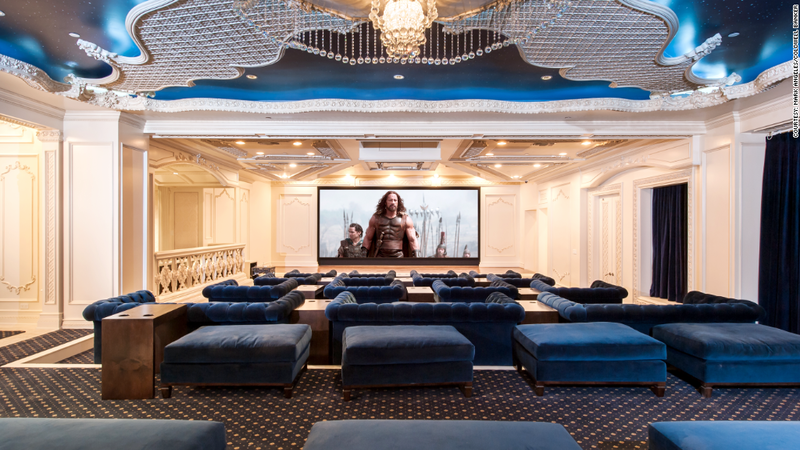 Not only can it accommodate 1,000 guests, but it also boasts a 50-seat theater, a bowling alley and a game room. There's also space to host a seated dinner for 250 guests. The disco/ballroom has it all, including a turntable dance floor. The ballroom is outfitted with laser lights, a DJ booth and a revolving dance floor. It also features a trompe l'oiel, sky-dome ceiling with more clouds painted on it than the typical Southern Californian sees in a day. There are expansive views of West Side of Los Angeles, Century City and the ocean beyond. The family room features a carved white marble fireplace. The family room, with its parquet floor, built-in cabinets, fireplace and comparatively modest dimensions, is perhaps the coziest room in the house. 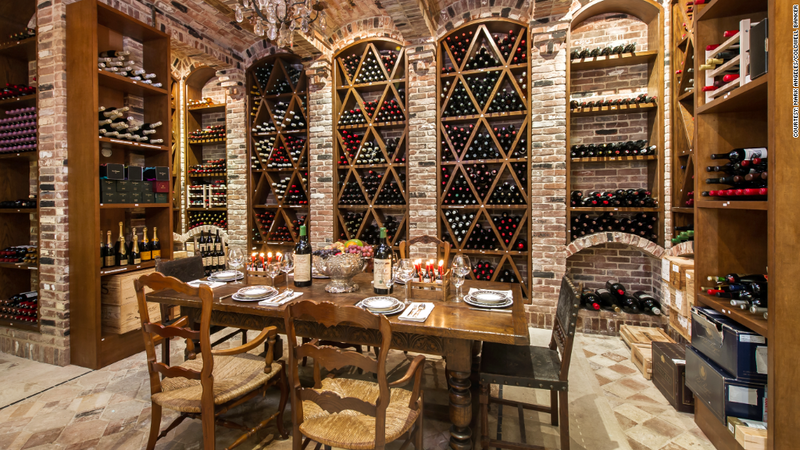 This is the small wine room. It holds a mere 3,500 bottles. And any vineyard must have its own wine cellar and tasting room. This one has space for 3,500 bottles. If that's not enough space, there's a more utilitarian wine vault downstairs that holds 10,000 more bottles. Without a doubt the Palazzo di Amore has a lot to offer, but can it bring in the full asking price? And it was only on five acres of land. 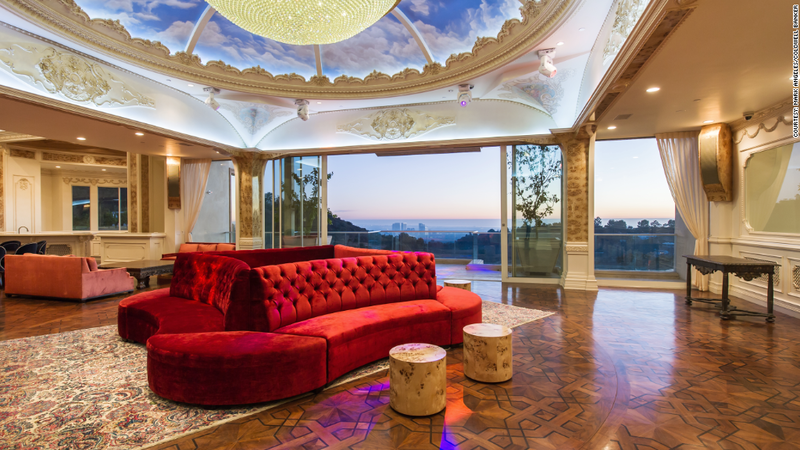 "This property is five times the size of that," said Stacy Gottula, the Coldwell Banker Previews International real estate agent who, along with colleague Joyce Rey, is showing the estate. 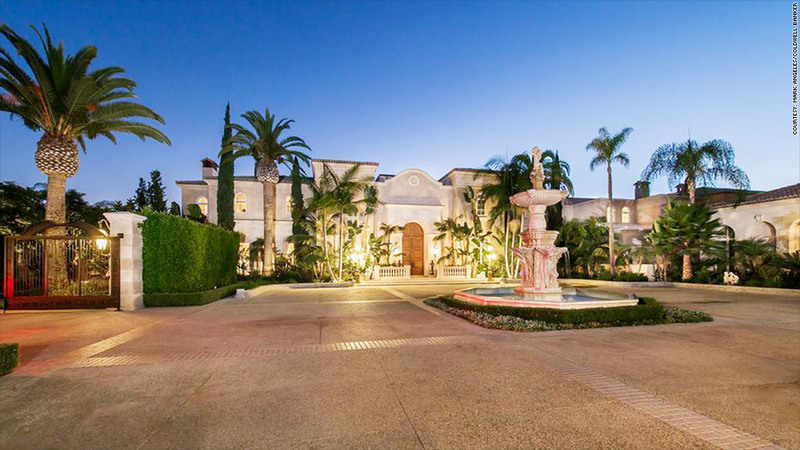 Several other similarly sized mansions have sold over the past few years in the Los Angeles area but none for more than $100 million, according to Jonathan Miller, an appraiser with Miller Samuel in New York. So asking for nearly twice that amount may be a stretch, he said. "What's unusual is the estate size," he said. "Still, $195 million is a huge number." Gottula said that several people have inquired about buying the Palazzo di Amore over the past few years while it was being rented out.